We are please to show off our new website that we have developed and launched on March 1, 2013. At Maplewood, our goal is to provide our residents, their families, and the community with a way to interact with us and to share a small glimpse of the type of services that we provide. We are constantly striving to provide exceptional care in a warm and loving environment. You'll be able to read about the various services that we offer including skilled nursing, rehabilitation, memory care, long term care, respite care and hospice care. You'll be able to take a look inside the wonderful community that we have built at Maplewood. You'll be able to monitor the various events that we are providing at Maplewood of Sauk Prairie. View the various pictures that include our staff, our activities and the community that we offer here. Review the community partnerships that we have developed, allowing us to serve our community in best way possible. These are some of the features that we are now offering through our new and improved website. 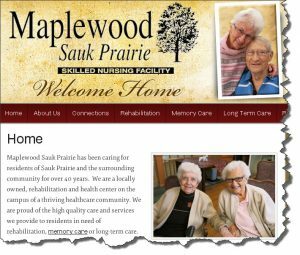 Welcome to Our New Maplwood of Sauk Prairie Website!